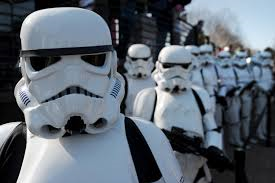 The G20 Security Team quite liked their new uniforms. In a case of particularly bad timing, my father’s heart started ‘tocking’ when it should have been ‘ticking’, so my parents will be visiting a specialist in Brisbane at the worst possible time; during the G20 summit. Fortunately for them, the State Government has declared a special public holiday for Brissy’s workers so there won’t be mobs of commuters to avoid, and tourist numbers are also expected to plummet like a stunned duck. Meanwhile, with brilliant comic timing, the Premier has offered inner city residents cash to leave the city for the weekend, while a worried Lord Mayor will be axing parking fees to prevent his vibrant shopping precinct being turned into a ghost town. Unfortunately, the place will be crawling with thousands of Police, SWAT Teams, soldiers, commando’s, undercover cops, snipers and secret service agents. Still, with all those heavily armed folk running about waving their weapons and shouting into their radios, Mum and Dad should feel fairly safe. And thanks to several new laws that would have made Stalin’s secret police stand up and applaud, criminal types, vagrants, protestors, ladies of the night, people wearing rude t-shirts and members of the Chaser Team will be rounded up and removed to an undisclosed location for free. Somewhere in that lengthy list of ‘Things that will get you shot full of holes’, is a law against carrying ‘Non-Weapons That Could Hurt Someone’. In my parents’ case this would be my fathers’ onion sandwiches and my mothers’ overloaded handbag. Personally, I won’t be surprised to see them on the news next week, spreadeagled on the ground, surrounded by screaming storm troopers outside the Putin-Abbot Shirtfront Showdown. Of course, that would also be another case of bad timing, but a sure-fire way of checking if Dad’s heart is still keeping good time. This entry was posted in On a Lighter Note... and tagged G20, G20 summit. Bookmark the permalink.